Use Storyline’s shape tools to create the tabs for your accordion interaction. We used a basic rectangle shape, but any rectangle option will work. Try using snipped or rounded corners for added flair. Add a new slide or layer to hold the content for each tab in your interaction. If you plan to use Storyline’s built-in Prev and Next buttons for navigation, create separate slides for each tab. If not, use layers. Add a trigger to each tab that jumps to the corresponding content slide or layer. 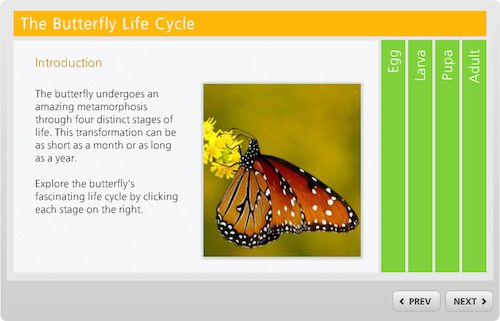 Add a fade transition to each slide or layer to make your accordion interaction move smoothly from one tab to another. That’s it! If you need help or ideas to get you started, visit the Articulate Storyline forum at E-Learning Heroes to connect with other Storyline users. Cool, and for our Studio users I quickly put together a Articulate Presenter version. Hi, I really like this effect but was hoping to have 8 tabs rather than 6. Is this possible? I’m new to Story line and I’m not sure how to add more tabs. I shall look forward to you’r earliest response! I was wondering was there anything on this particular template that you cannot implement using PowerPoint? TC, if your using Studio’13 there’s actually an Engage interaction for the accordion! Check it out if you haven’t already. Comments are closed on this post. Need more help? Post your question in the E-Learning Heroes Discussions. Sylvia Wright: Way to go San Diego!! Peg John: Just another reason why I like the Articulate products and the folks that create and support them. Create compelling e-learning courses with stunningly simple, remarkably powerful software from Articulate.